We all know brushing our teeth twice daily is a key to good oral hygiene, but when it comes to choosing the righttoothbrush, is shelling out the extra worth it? With the wide range of designs of toothbrushes available in the market today and the ongoing debate between manual and electric toothbrushes, selecting the right toothbrush can be confusing. 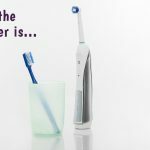 The answer to this is simple.If we spend the right amount of time and the correct technique, the simplest of the manual toothbrushes can do the job as well as compared to the costliest of electric toothbrushes. Why still the debate? 1) They do the cleaning for you- Electric toothbrushes with their vibratory and oscillating motion removes plaque and debris quicker than the manual toothbrush. The only job that it requires from its master is to move it from one tooth to the other. 2) A higher IQ? The more advanced electric toothbrushescome with a pressure sensor. They are smart enough to point out to you if you’re applying more than the required pressure for cleaning. This sensor is advantageous especially for the heavy scrubbers who feel they need to scrub their teeth squeaky clean which eventually leads to loss of enamel. Yes, sensitivity is the prize to all those scrubbing champions! 3) Electric toothbrushes are manufactured with a bulky handle which helps elderly and people with arthritis as it is much easier for them to hold the toothbrush. As mentioned above since they do the work for you, they require lesser movement when compared to the manual toothbrush. 4) Tick-tock tick-tock: Your electric toothbrush is a spy hired by your dentist. Since he can’t be everywhere, electric toothbrushes with timers guides you to spend the two minutes that’s the minimum requirement to attaining a thorough clean. 1) Expense – They are expensive when compared to the manual toothbrush,but with all the pros mentioned above, it is worth going the extra especially for certain people. At Niddrie Dental Clinic we are constantly trying to motivate our patients to achieve the best of their oral health. In the end, if you go for your regular dental check-ups and your dentist is happy with your brushing, there is no real need to go electric!